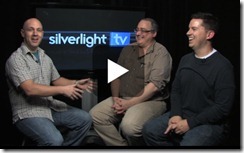 The Silverlight HyperVideo Project has made two guest appearances on Silverlight TV. In the first, I talk with John Papa about the project itself and how it has evolved. Then, during Mix, Tim Heuer and I sat down with John to discuss What’s New In Silverlight 4, and I managed to sneak in a few comments about the HVP as well. Silverlight TV has numerous great interviews, and is quickly becoming a valued asset throughout the Silverlight community. Tens of thousands of people view each episode. Check it out here. Then take a look at John Papa’s site as well. Then come back here, because the last thing I want is for you to decide you like JP so much you stop visiting. Next thing you know, I’m sitting in the dark. This entry was posted in HyperVideo Player and tagged Community, HVP, Patterns. Bookmark the permalink. BrittanyPosted on January 24, 2013 at 8:15 pm | How about trying to frsnuaide some money? There are a lot of frsnuaiders that are free to start. And you can get a professional domain for cheap, check around for some prices. The top hosting sites are godaddy.com hostgator.com yahoo.com and homestead.com is pretty good too. Usually the first month is free for most. And how about finding some volunteers? Im pretty sure there is a lot of ppl who would like to join an art club. Post an ad on the activity section of craigslist once you get your site up and everything. But unfortunately if you want your site to be popular and want a big audience you will have to do some paid advertising. But also use free advertisement like social media, and Blogging. Good luck!